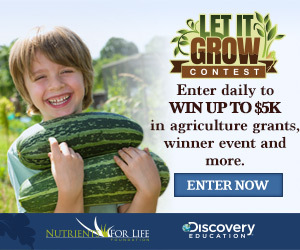 Discovery Education and the Nutrients for Life Foundation have joined forces again to give six lucky schools a chance to win big with the second annual Let It Grow Contest from the partnership program, From the Ground Up:The Science of Soil. Open to educators and community adults nationwide, the Let It Grow Contest encourages entrants to vote DAILY for a middle school* of their choice for a chance to win an agricultural grant, which could be used towards a school garden or gardening supplies, professional development, and more! Five Runners-Up will each win a $1,000 agricultural grant and an opportunity to win a celebratory school assembly. Don’t forget to share with your friends for extra entry opportunities!